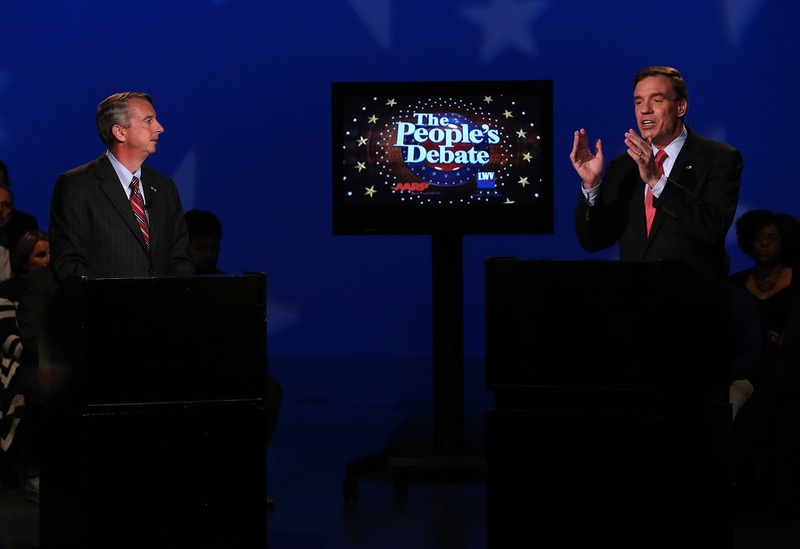 By Warren Fiske, Sean Gorman, Nancy Madsen on Monday, October 13th, 2014 at 11:26 p.m.
Sen. Mark Warner, D-Va., right, gestures as Republican challenger Ed Gillespie listens during Monday night's People's Debate at WCVE studios in Chesterfield County. Time and again during Monday night’s U.S. Senate debate, incumbent Mark Warner insisted that Republican Ed Gillespie had "taken" Grover Norquist's pledge not to raise taxes if he were elected. And Gillespie kept denying he had "signed" the pledge. Norquist, the president of Americans for Tax Reform, told us after the debate that Gillespie never signed the oath. But Warner can hardly be blamed for spreading bad information. ATR’s web site says Gillespie signed the pledge on June 4, 2014. We asked Norquist to explain the error, but did not get a clear answer. The web site also posts a Norquist letter from the same date to Gillespie, lauding him for taking a position "above and beyond the letter of the Taxpayer Protection Pledge." Norquist said he wrote the letter in recognition of Gillespie’s verbal promises to voters not to support tax hikes. Gillespie "has said publicly that he won’t raise taxes, but he hasn’t signed our pledge," Norquist said. Warner: Gillespie "even went out and called himself a partisan warrior"
Gillespie: Unfortunately, Senator Warner voted to raid Medicare of over $700 billion, siphon it off into a new entitlement program called the Affordable Care Act." PolitiFact has rated similar claims either Half True or Mostly False, depending on how they’re worded. The health care reform law includes a series of cost savings measures to help pay for itself. The Congressional Budget Office has estimated those measures will save $716 billion from 2013 to 2022. It’s important to note Medicare spending will continue to rise, but at a slower pace than it would have without the law. The savings are focused on lowering payments to hospitals and insurance companies -- not beneficiaries. Some health care analysts, however, have said the law’s savings might still impact some seniors -- particularly those on privately-run Medicare Advantage plans which offer greater benefits than traditional Medicare for things like dental care and free eyeglasses. Warner: "I support the Keystone XL pipeline. matter of fact, (I) even got protested against it in Harrisonburg." Warner has largely voted in favor if Keystone. In 2013 he backed a budget resolution calling for Keystone construction and has signed several bipartisan letters urging the administration to approve the project. And, indeed, he faced protesters against Keystone in Harrisonburg in March 2013. But as Gillespie points out, Warner did vote against a 2012 measure declaring that the administration’s environmental sign-off on the pipeline the previous year satisfied all federal permitting and authorizations needed to start Keystone. Warner said then that even though he favored the pipeline, he thought it should be used as leverage to force Congress to pass a comprehensive energy bill that would include tax incentives for producing alternative energy. This was a single instance of opposition and was a grain of truth for Gillespie’s claim that Warner had a record of opposition to Keystone -- a claim that we found Mostly False. Gillespie: Senator Warner voted for "nearly a trillion dollars in tax increases." Warner voted for the Democratic Senate budget plan in March 2013. That bill called for $975 billion in new revenues over 10 years to be matched by an equal amount of budget cuts. The new revenues would have come from targeting tax breaks used by high earners and corporations. This budget proposal died in the Republican-controlled House of Representatives. We found this claim to be True. PolitiFact Virginia, "Ed Gillespie says Mark Warner’s record is against the Keystone XL pipeline," June 23, 2014. PoltiFact, "Romney says Obama ‘cuts’ $716B from Medicare to pay for Obamacare," Aug. 20, 2012. PolitiFact, "Mitt Romney says Barack Obama robs Medicare of more than $700 Billion to pay for Obamacare," Aug. 15, 2012. PolitiFact Virginia, "Gillespie says Obamacare ‘cuts seniors Medicare,’" Sept. 8, 2014.